Acid house hedonists, indie rock ‘n rollers; Primal Scream are a band who have built a 30-year career on the art of reinvention and they are bringing their incendiary live show back to Australia, more powerful and engaged than ever. Bobby Gillespie is the consummate rock & roll star. Willowy, wispy and radiating swagger, he struts around the stage, mic in hand like the genetically-engineered love child of Mick Jagger and Jim Morrison. His presence and ability to throw himself into a tune - spinning, sweating, hair plastered over his face, accompanied by trademark hand claps - still thrills crowds and propels Primal Scream into a league of their own. 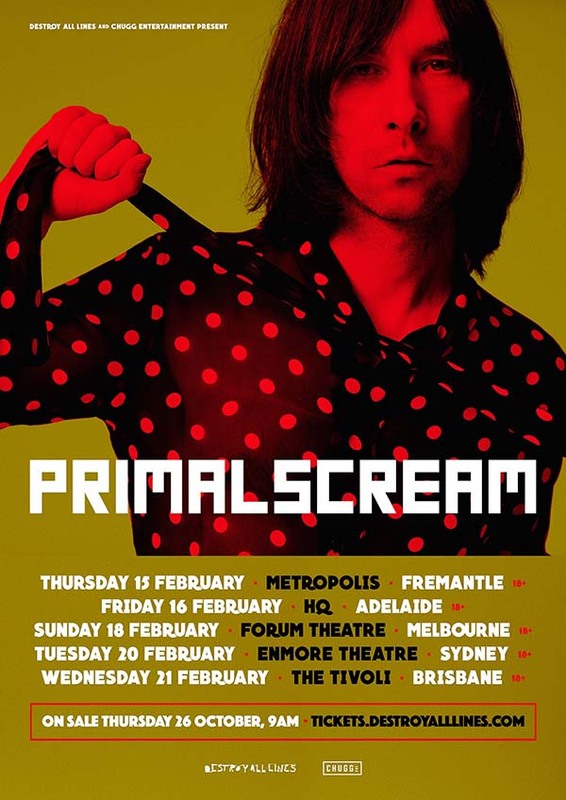 Primal Scream will always say it with passion and energy and will be wowing Australian fans in February 2018, playing an all-encompassing greatest hit set including tracks from their legendary 1991 album Screamadelica.